Three Art Center student projects are finalists for Interaction Design Association’s (IxDA) Interaction Awards People’s Choice Award. Support our students, vote now! Every member of IxDA’s online community gets three votes for their favorite project. You must register on the Interaction Awards site specifically to vote. Voting closes February 3rd at 12 pm GMT. The winner of the People’s Choice Award will be announced at the Interaction Awards Celebration on Friday, February 3rd, at Interaction12 in Dublin. 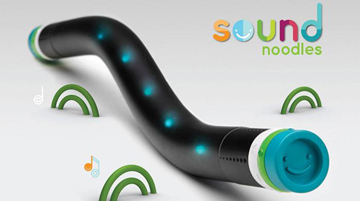 Sound Noodles, by Jessie Kawata, are mobile electronic music instruments that enable kids to explore the relationship between sound and movement through their own physical activity and the collaborative efforts of music creation. Go here to vote for Sound Noodles. 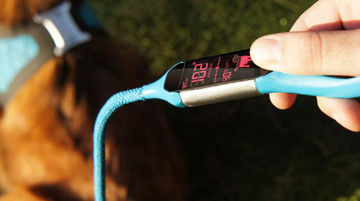 Hotdog, by Scott Schenone, is a dog harness design that keeps track of a dog’s body temperature and relays the information back to the owner. Go here to vote for Hotdog. 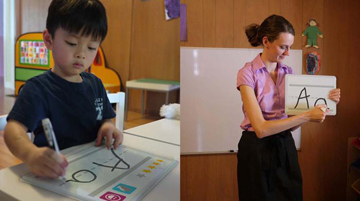 Steps, by Kevin Kwok, Nancy Chui, Rachel Thai, Winnie Yuen and Wayne Tang, are interactive tools and encouragement for 21st century teacher to use 21st century social interaction. The Steps project is also a finalist for the 2012 Interaction Award in the field of Connecting (facilitating communication between people and communities). Go here to vote for Steps. My choice would be hotdog. This is really great very talented young people.